The G8LED 900 watt G8-900 grow light is ideal for someone looking for one of the best lights for indoor growing. High Times Magazine already awarded the G8LED G8-900 with The Best LED Grow Light Award in 2016. It makes use of high-quality full-spectrum LED lights, and provides users with a light lifespan of about 50,000 hours. This helps to conserve energy at a rate of at least 800W per hour. With such longevity and power-saving potential, the grow light is definitely a great choice for indoor growing. You can see the other features and specifications in greater detail in this G8LED G8-900 Review. The G8LED 900W incorporates LED lights from Epistar, BridgeLux, and Optotech. You get to use visible red and blue lights, along with infrared and UV LEDs to give an 8-color full spectrum to help your plants grow effectively. The grow light’s panel comes with Zener diodes to avoid surges and burnouts. You can easily run the light for 18 hours every day since its fans along the topside of the panel keep the LED lights running cooler than traditional ones. The LED growing light’s panel comes with Zener diodes to avoid surges and burnouts. 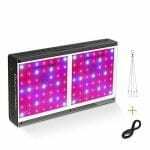 You can easily replace LED grow lights of 1000-watt with this grow light’s 540-watt power output that lasts 18 hours every day, since its fans along the top side of the panel keep the LED lights running cooler than traditional ones. 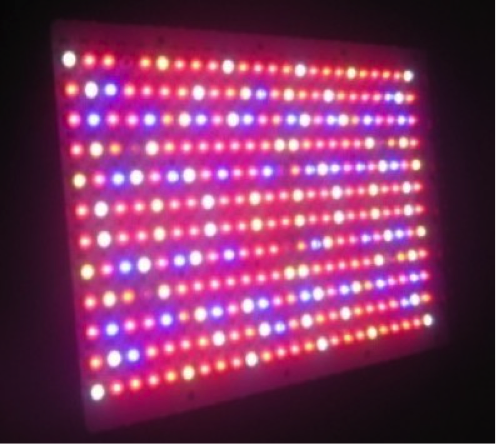 Using the G8LED 900 watt G8-900 panel close to your plants won’t burn or dry them out, but can cause discoloration and stunted growth. It is recommended to hang the panel 26″ -42″ above your plants. If you want to grow your plants taller, 42 inches is the ideal hanging distance. While hanging the G8LED 900 watt G8-900 grow light at 26 inches can help you get shorter, bushier plants. 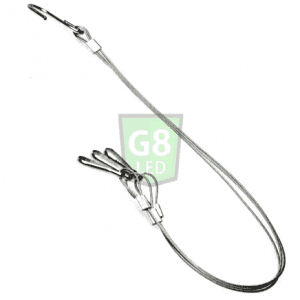 The light also comes with strong, durable wires for hanging. Please also test the heights with your plants. Different heights will have different effects on different types of plants. The G8LED 900 watt G8-900 is a 22-pound lightweight product that has 20.5″ x 14.0″ x 3.0″ dimensions to make it compact and ideal for regular apartments and houses. 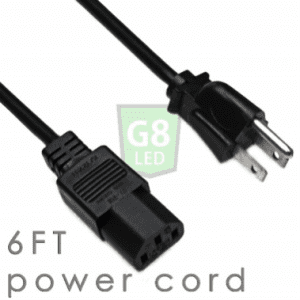 It also comes with a 6-foot power cord that is compatible with power supplies worldwide. The G8LED G8-900’s design is unique since it doesn’t use a veg/flower switch. The inclusion of a veg/flower switch usually involves turning off come of the red diodes during the vegetative phase and then turn them on for flowering. 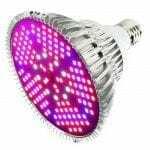 That reduces the LED growing light’s energy efficiency and power utilization that results in fewer diodes being used to give energy to the plants. The G8LED 900W averts this problem by using just one light for both these stages so you get maximum efficiency. The entire G8LED series provides its buyers with a 90-day money-back guarantee, along with a 2-year warranty specifically for the G8LED 900W G8-900. Furthermore, the company’s customer service promises to fix and repair your panel and LED lights in case of any problems or mishaps. The G8LED G8-900 900 watt LED Grow Light Full-Spectrum isn’t exactly the most affordable grow light. That said, you definitely get your money’s worth without having to compromise on quality, performance or power. The grow light is definitely a better choice than traditional hot, costly and bulky LED grow light systems. The G8LED 900 watt G8-900 promises fast growth results with true energy efficiency. You won’t need a new replacement with this light anytime soon. Looking for a smaller version of this light? 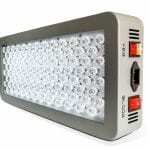 Check out the review of the G8LED G8-600 grow light.